Wizards Storage Portal was upgraded on July 2. With Wizards Storage Portal 3.25 we introduce 4 completely new widgets for Wizards for TSM. The purpose of the new widgets is to provide a general overview of your entire TSM environment at a glance, or a section thereof if that is what you need. 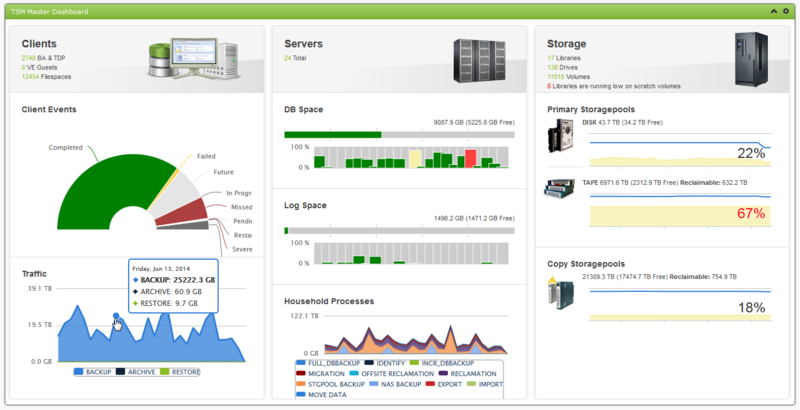 The new widgets can be configured to show data from exactly the servers you need them to. 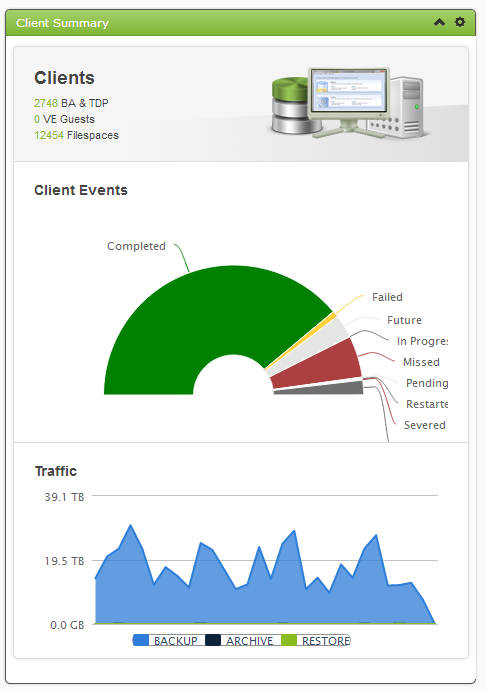 This widget gives you insight into the Client level, Server level and Storage level of your TSM environment in one simple view. All charts are clickable thus enabling you to drill down if something catches your attention. This widget gives you a complete picture of your clients and their type. A donut chart shows you the distribution of Client Events for the last 1 to 72 hours for any one- or all of your TSM servers. Furthermore this widget gives you a visual presentation of traffic history and can be customized to show data from the last 7 days up to 30 days. TSM Server Summary widget: This widget provides an overview of your TSM Servers. 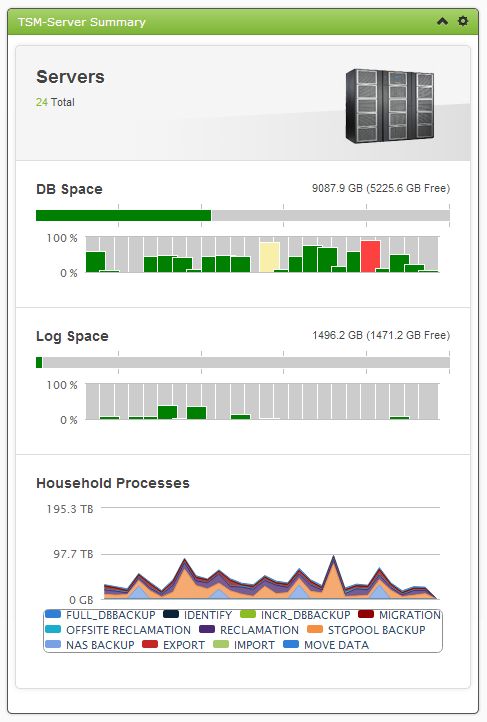 It furthermore provides insight into DB and Log Space capacity, both total space and free space. The Household Processes chart provides a historical view of the amount of data, processed by various types of server activities for a customizable period of time. The charts are again clickable and provides the opportunity to drill down for further detail. 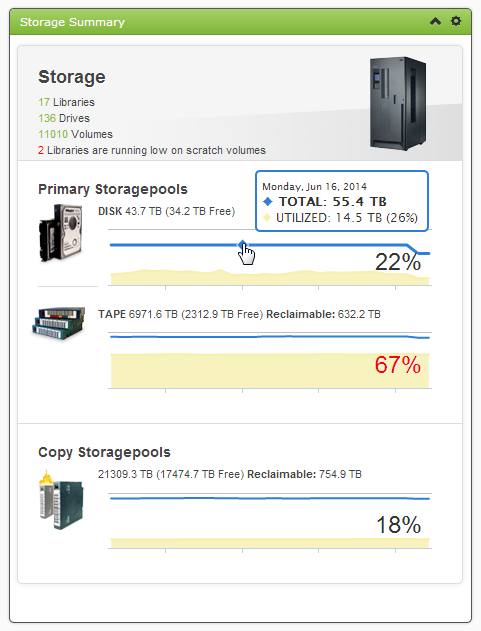 TSM Storage Summary widget:The Storage Summary widget gives an overview of the capacity history of TSM storage pools based on pool category (Disk, tape and copy). The widget allows you to configure thresholds for maximum used capacity, after which the latest used capacity percentage goes to alert state. eg. If the Primary Storagepool threshold is set to 50% and the amount is exceeded, the numbers will appear in red thus calling attention to the breach!